It was an unseasonably cold afternoon in early November, but the space at Slought Foundation was filled with the warmth of celebration, remembrance, and, as the poignant acceptance speeches went on, more than a few tears of happiness. 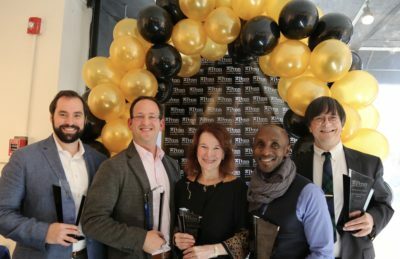 At the inaugural induction ceremony for Penn’s School of Social Policy & Practice (SP2) Alumni Hall of Fame, multiple generations of SP2 community members came together to honor five exceptional social change agents and practitioners – one representing each of the School’s five degree programs – who were named SP2’s 2018 Alumni Hall of Fame inductees. This commemoration was, in fact, the very first of its kind. As Herb Whren (MSSP’10), Chair of the Dean’s Alumni Advisory Board, explained in his opening remarks to the crowd, SP2 (once known as the School of Social Work) was established over 100 years ago. Within that considerable time span, many notable alumni have left indelible impacts on the Penn community, their respective fields of research and practice, and the lives of countless students, colleagues, and clients. However, there was no established way of recognizing the accomplishments and contributions of remarkable SP2 alumni— until now. At the start of the year, a call for Alumni Hall of Fame nominations went out to SP2 faculty, staff, alumni, and current students. From this pool of recommendations, the five honorees were selected by Dean John L. Jackson, Jr. and the Dean’s Alumni Advisory Board. Following Whren’s remarks, Bart Miltenberger, Associate Director of Institutional Advancement at SP2, introduced each of the honorees and announced the inaugural June Mann Averyt Memorial Scholarship, awarded to SP2 student Madelaine Guss (MSW’19). Each inductee, as well as the late Dr. Averyt’s husband, Murray McKay, were present to accept their awards. The honorees were joined in celebration by their loved ones and invited guests, SP2 faculty and staff, members of the Dean’s Alumni Advisory Board, and the individuals who submitted their original nomination letters. Addressing the room, the inductees spoke passionately of their respective, lifelong commitments to social work practice, educational equity, issues of mass incarceration, and advocacy for those experiencing homelessness. Toasts were given, memories were shared, and the occasion— like each of the inductees’ legacies— was truly unforgettable.